Více informací naleznete v letáku (česky ve formátu pdf) zde. Developed in partnership with leading maternal-fetal educators and biomedical engineers, Lucina is the only childbirth simulator with validated maternal-fetal physiology. The physiological modeling allows learners to monitor and manage both patients without instructor intervention. Today, practice time in real clinical settings is limited and can be risky. With Lucina, learners gain hands-on experience performing normal deliveries and pelvic exams to recognize cervical dilation, effacement, presentation, position and station. 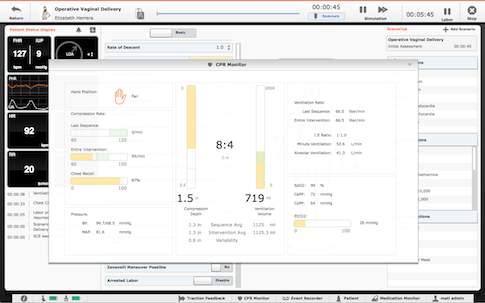 Following delivery, the simulator uses arterial and venous blood gas values to give one-minute and five-minute APGAR scores based on how well the learners managed the delivery. Fetus is soft where is should be soft and firm where it should be firm with palpable landmarks, and supports simulated suctioning with an open mouth and nose. Advanced CPR metrics measure the consistency of compressions and ventilations as well as coronary and cerebral perfusion pressures. System detects hand placement, chest recoil and left lateral tilt. Durable, flexible airway accommodates most airway management adjuncts including ET tube and LMA. Newly designed neck supports the sniffing position. Shoulder dystocia is one of the most stressful emergencies encountered by clinical teams. Potential outcomes include post-partum hemorrhage, perineal tears and in the baby, fetal brachial palsy. With the Fidelis Lucina birthing simulator, teams can prepare to respond quickly and effectively to shoulder dystocia by practicing a full protocol of childbirth maneuvers. The simulator’s pelvic tilt allows practice of the McRoberts maneuver. Her realistic pubic symphysis can be felt when applying suprapubic pressure. With integrated maternal-fetal physiology, the fetus responds automatically to maneuvers and delivers an APGAR score based on how well the learners managed the intervention. With fewer vaginal breech deliveries being performed worldwide, clinicians have less experience performing emergency breech deliveries. The Fidelis Lucina Maternal Fetal Simulator fetus was designed with better tactile realism for the identification of breech presentation and delivery. 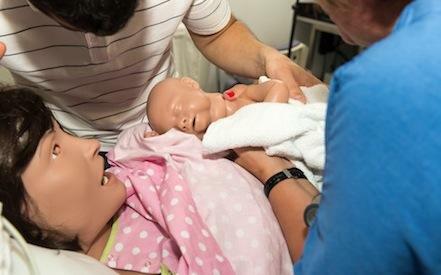 Is downtime costing your childbirth simulation program too much? The Lucina Maternal Fetal Simulator was designed for reliability and extensively tested. For a limited time, we’ll take in your childbirth simulator on trade and give you a discount toward the purchase of the Lucina simulator. We’ll even cover shipping costs. Find out how much your simulator is worth as a trade-in at caefidelis.com. The Lucina Maternal Fetal Simulator now offers the option to add a Female Patient Module with a non-pregnant abdomen and five Simulated Clinical Experiences (SCEs). Use your Lucina simulator year-round as both an obstetrical patient and a normal female patient. Users can also create their own SCEs on the Müse system. Operate Lucina with our latest version of the user-friendly Müse interface. The software includes ten evidence-based practice scenarios complete with patient history, documentation, learning objectives, facilitator’s notes for debriefing and more. 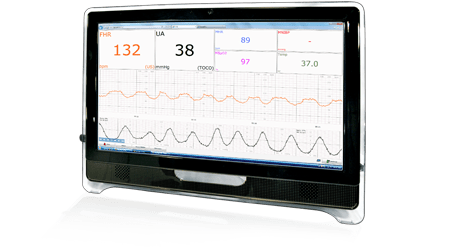 The emulated cardiotocograph (CTG) monitor displays maternal and fetal physiological data as well as an on-screen reproduction of the paper strip produced by a real CTG printer for a realistic virtual childbirth simulation.